Trang Tien Plaza was the first project developed by VINACONEX, which marked the milestone for the corporation’s transformation into the trading - service field. 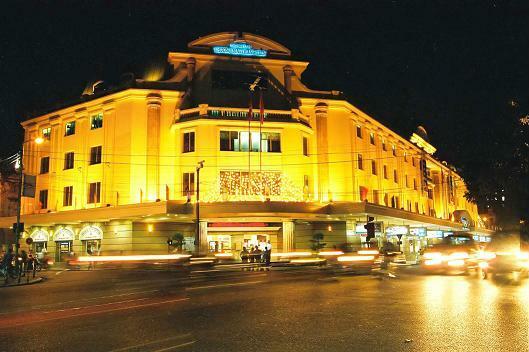 For years of uninterested attention to other investors, Trang Tien Commercial Center (Trang Tien Plaza) was reborn by Vinaconex and met the expectations of Hanoi’s citizens. Located in the center of Hanoi and equipped with the most modern facilities nationwide (as for its first opening in 2000), doing business in Trang Tien Plaza is the dream of every businessmen. One success builds another, the model of Trang Tien Plaza has been scaled up to different provinces and cities in Vietnam such as Thanh Hoa Plaza (Thanh Hoa city), Ha Dong Plaza (Ha Dong town), Son Tay Commercial centre (Son Tay town), and Vinh Yen Commercial centre (under construction in Vinh Yen town, Hanoi). Besides commercial centers and supermarkets developed by VINACONEX and subsidiaries, VINACONEX also implements commercial activities in the new invested urban areas such as Trung Hoa Nhan Chinh new urban area. These activities meet the demand of people in the new urban area. On the other hand, as living standards of people increased and identifying demand for relaxation and recreation among national and international customers, VINACONEX focused on hotels and tourist, and invested in a chain of hotels such as Cat Ba Island, Hai Phong city (Cat Ba Holiday View Hotel has 120 rooms and this is the biggest hotel on the island), Bai Chay, Ha Long city, Quang Ninh Province (Suoi Mo Hotel has 167 four - star rooms), Sam Son, Thanh Hoa Province (Sam Son Hotel), Hue city (Ky Lan Hotel).